Freedom is not free. Despite how it reads from the first four letters, it comes at a high price. Our citizens enjoy an abundance of this freedom through the rights enumerated in our Constitution. Our most important of these freedoms is of course, the freedom of speech. It allows us to speak freely about our points of view in politics, religion, and life. Yet, this has come at a price, a high one at times. Our country secured its freedom from an oppressive monarchy. Later in our short history the slaves obtained their freedom through a civil war that almost dared to destroy our unity as a nation. Yet, we survived. To have lived through those times was not an easy ordeal. It was a life of great uncertainty. Today we are living a similar uncertainty where we face each day with dread on what is to come of us as a nation. Back then, no one could fathom how great a nation we would become despite the overwhelming odds. I was reminded recently that while we were founded on principles of unity and pursuits, our nation then was a young country embracing all walks of life that gave her a breath of life with courage, allegiance, and above all respect. The Response, called upon by Governor Perry was an attempt to unify our country. Despite the criticism that he received regarding the inclusion of certain religious groups while excluding others, the Governor spoke about what is disuniting our country and how our lack of faith in ourselves is causing our nation to falter in greatness. The petty criticism of exclusion pales in comparison to what the event awakened in all of us. The message was simple and clear: when in doubt, pray; when in uncertainty, pray; when seeking healing pray. The event was not about advocating one religion over another, it was a message of taking responsibility and doing something other than criticize. How dare he combine his governmental duties with religion, many expressed. How dare he not, should be the statement. Since when did praying become evil? When did believing in God become hateful? The Governor asked that everyone pray for our nation. In fact, he talked about our praying for President Obama and his family during this trying crises. It was an eloquent request. One that should have crushed the doubt about the sincerity of the event or the Governor. We need a time of healing that was called upon by prayer. The moment was an awakening for every American to take responsibility as citizens and engage in our communities and our country. Providing monetary support is good, but it is not sufficient to provide that assistance that our nation needs at this time. We need to engage into our country as human beings of unity. So when we talk about blaming the other party, or interject with rhetoric about the high debt ceiling, and evading the real issues that face America at this very moment, but forget to honor God, how can we expect to expand into the world of faith? 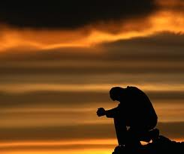 If we cannot take a moment to be silent and embrace prayer as a respectful and humbling moment, how then can we begin to heal our nation and our weary hearts?